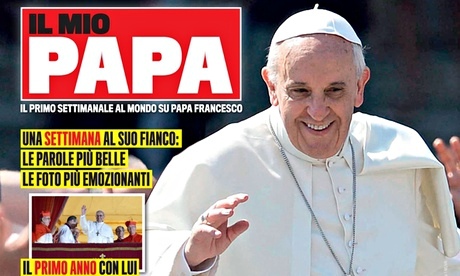 Pope Francis is now the subject of a supermarket aisle fanzine called Il Mio Papa or “My Pope”. The magazine even has a centerfold pin-up style photo of the pope clad in windswept vestments. The 77-year-old pontiff, nearing his one-year-anniversary at the helm of the Catholic church, has a magazine all to himself. Mondadori publishing house, which lists the popular celebrity gossip rag Chi among its titles, launched the magazine entirely devoted to the weekly doings, sayings, gestures and activities of the 265th Successor of Peter. “My Pope,” is 50 cents ($0.70) a pop and will include a free pull-out poster with one of Francis’ more memorable quotes from the previous seven days. “The idea for a magazine designed to report on and share the words and actions of Pope Francis came from observing how his election has stimulated a renewed interest on ethical, religious and moral issues,” said the editor Aldo Vitali. “In fact, the current Pope is a figure who, thanks to his empathy, as well as the power, the courage and the simplicity of his message, has won over everyone, both the faithful and non-believers,” Vitali concluded. The magazine will report on the week of the head of the Catholic church – his meetings, pronouncements, engagements and audiences (in particular the Angelus and the Wednesday general audience) – paying special attention to the message of change that characterise the pontificate of Pope Francis. There will also be articles on the people and facts that inspire his work and words, as well as smaller items of curiosity and images that show the great simplicity of the Holy Father in the most ordinary daily events. But wait, there’s more to this remarkable marketing marvel. The first issue of Il mio Papa includes an extensive feature celebrating the anniversary of Papacy that will also be covered in a special DVD to be included as a supplement to the magazine the following week. The new magazine will have a total print run in the first month of 3 million copies and www.miopapa.it is being developed. Genius. Hey, if someone wants to create a magazine like this to showcase the pope more, I’m okay with that. I’m not a really religious person, but I can see religious people getting into this. And the fact that the magazine is cheap makes it even better I think.